Privacy advocates are raising concerns over a new technology being implemented by a couple of malls that will allow them to track the movements of their guests using the unique ID numbers of their cellphones. 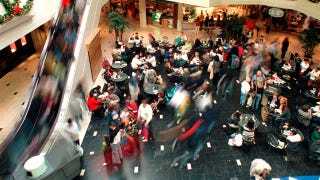 The system, called FootPath Technology, uses a series of antennas located throughout a mall to register a shopper's cellphone, and then tracks its movements from store to store. This provides planners with detailed information about how guests navigate the mall, which stores are most popular, and what areas might be under-trafficked. While it's being used in the U.S. for the first time starting on Black Friday at the Promenade Temecula in California and the Short Pump Town Center in Richmond, Virginia, the system is already in use in shopping centers in Europe and Australia.